One of the most interesting sets ever produced is the 1916 Tango Eggs baseball card sets. The cards themselves are not particularly remarkable, but the story that has followed the set in the past two decades makes the set nearly impossible to collect. The 1916 Tango Eggs set consists of possibly 20 unnumbered cards that measure 1-7/16” by 2¾” and have a glossy sheen on the front. The Tango Eggs baseball cards are reminiscent of the E106 American Caramel set, which has similar bright, solid color backgrounds. The back features an advertisement for Tango Brand Eggs. The set was issued in 1916 by the L. Frank & Company out of New Orleans. L. Frank & Co. sold poultry and eggs and continues to exist as a food distributor in New Orleans today. Although the Tango Egg cards were printed in 1916, the real story doesn’t begin until the 1990’s, when a large collection of the cards were found in New Orleans. The vast majority of the cards that are known to exist today are likely from this one collection. Interestingly enough, there has never been verification of several of the cards that allegedly exist, including Honus Wagner and Joe Tinker. Existence of a Ty Cobb card was recently verified. Additionally, many of the cards that do exist have the wrong player on the front. 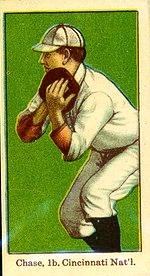 The cards of Billy Meyer, Buck Weaver, and Happy Felsch all feature different players. While some of the cards have never been found, the Hughie Jennings and Bob Bescher cards make up approximately half of the entire population of the surviving Tango Eggs cards. Here at DeansCards.com, we are always interested in buying rare baseball cards. If you are interested in selling any Pre-War baseball cards, please click here. If you are interested in viewing our Pre-War inventory, please click here.